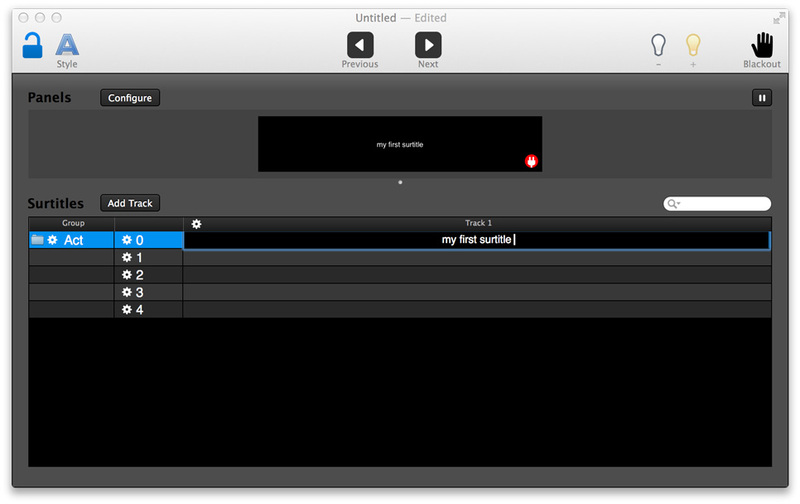 Create, edit and display surtitles with an ergonomic interface : you do everything in one place. It even saves the different version of your project, so you can go back in time. Connect up to 6 screens. Use several tracks in the same screen, to display different langages. Manage the zoom and the space between tracks. Of course, traditional keyboard shortcuts are working, so styling never have been so fast. Type a few letters, and find anything in a snap. There are also special searches, to list surtitles with a special style for example. Never loose the numbers. You can disable a surtitle, or create intermediate ones, so the indexes do not change. It requires an Apple Macintosh and OSX 10.7 (or newer). why do you need my email ? Glypheo is very easy to use : learning the basics is a matter of minutes. Then, you will find many features that will ease your job. Before asking us a question, be sure to have read the tutorials below. Pour les utilisateurs Français, un tutoriel PDF est disponible ici. If needed, click on "Toggle Fullscreen"
The "Next" button goes directly to next surtitle, but you can also use the "Black/Next" button. Indeed, this is very practical if you want to have a black before going to the next surtitle. Simply drag-and-drop the index to change the surtitle order. Of course, be sure your project is "unlocked" to perform such action. Create an intermediate surtitle or disable one, so the indexes are preserved. It makes your job very flexible : intermediate surtitles play as any surtitle, but disabled ones won't be shown. You can customize the style per surtitle and revert it if needed. But you can also change the style for the whole track (bold, italic and underline are not affected). 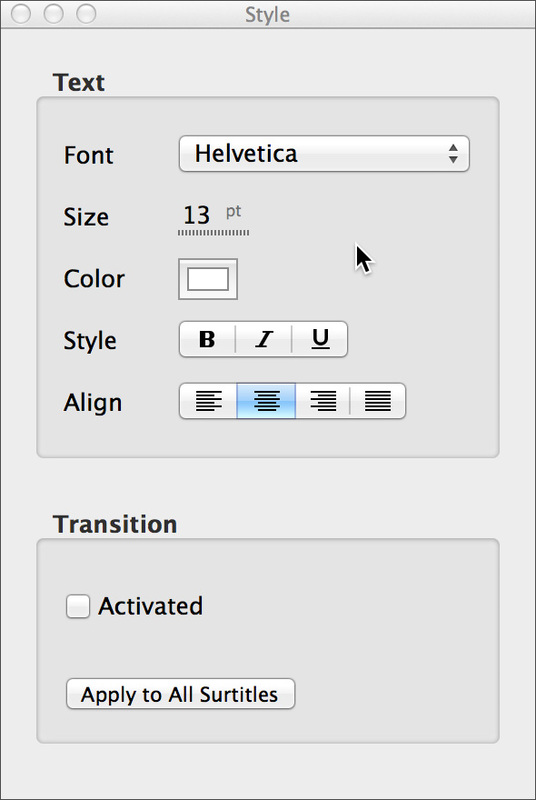 To create a fade when switching from one surtitle to another one, use a transitions. Click on "Apply to All Surtitles" to set the same transition for all surtitles. When the project is "unlocked", you search for surtitles : just type a few letters. You can also run special searches : surtitle with a special style, a transition or disabled ones. You can create groups to organize your surtitles. When deleting a group, Glypheo proposes you to move the surtitles to another group. You can display the surtitles on multiple panels. simply create several ones, then add tracks to them, manage the zoom, alignement, and space between tracks. Also, you can rearrange them so the whole preview matches the physical world. If you want to change something in your project, without affecting the output, use the pause button. To smoothly fade out the output, use the "Blackout" button. Depending on the environment, it is useful to control the luminosity of the output. Use the "+" or "-" to adjust the luminosity. Glypheo can import a track from an HTML, Word or TXT file. You can choose to preserve the style, and set a custom separator. Exporting a track got the same options. You can assign keyboard shortcuts to navigate through surtitles. Also, you change the default font. 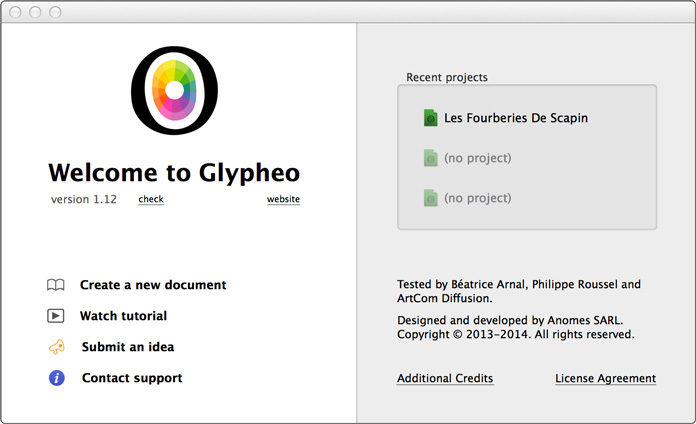 Glypheo uses the built-in OSX Time Machine. Click on "Browse All Versions..." to go back in time. You can see most of the keyboard shortcuts from the menubar. Also, you can add your own by setting them in System Preferences. See this tutorial. Glypheo features a Syphon output. 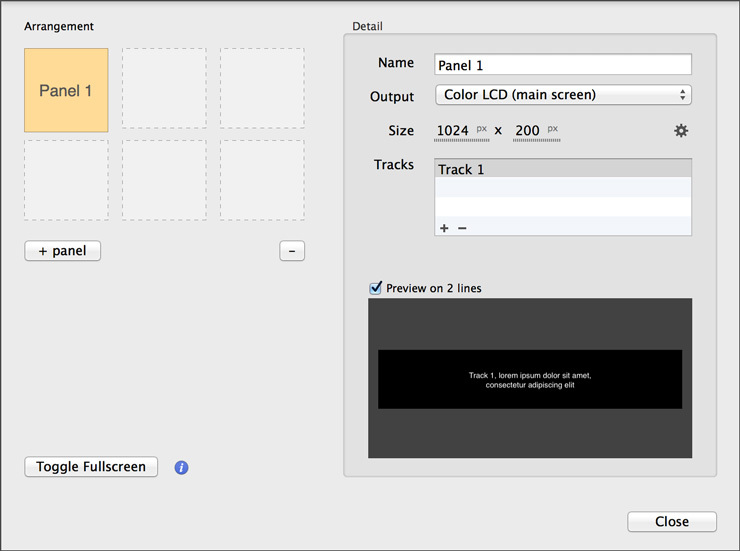 So video frames can be shared with other softwares such as Millumin, VDMX, MadMapper or Max. Simply open your favorite application while Glypheo is running, and a Syphon server will automatically appear (one per panel). You can control Glypheo via MIDI : open the Preferences and choose some CC to go previous or next surtitle. You can also control Glypheo via OSC, for example with TouchOSC on your mobile phone.